Each year after the autumn equinox in late September we begin to notice that there are more hours of darkness than there is of daylight. At the end of October when the UK "puts the clocks back" moving from British Summer Time to Greenwich Meantime, it becomes more obvious. For some people this change can upset sleeping patterns, as can long distance flights, where jet lag, for some, can be a problem. This led me to think about birds, some of whom are long distance travellers, and their sleeping habits. Research on caged birds, during their natural migration period, reports that their sleep pattern is reversed. That is, they are awake at night when they would be migrating and resting during the day. The rest that was taken was unusual as instead of long periods of sleep, there were many short periods lasting about ten seconds. Power naps? In addition, it was noted that they would sleep with one eye open, half asleep, or partially shutting both eyes. On the other hand, research on Lapland Buntings in the 24 hour daylight of Arctic summer showed the birds maintained a schedule of resting for several hours each day between about midnight and 4.00am. Other studies have shown that mammals and birds have similar types of sleep. The rapid eye movement sleep lasts about a quarter of the time. It is during this period that humans dream. In the deeper non-rapid eye movement sleep muscle tone is maintained and some humans sleep walk. Some birds like Swifts are able to fly while asleep. How can they do that? It has been shown that birds, like Swifts, and some aquatic mammals can rest one half of the brain while the other half is awake. Unihemispheric sleep or half asleep. If the right hemisphere of the brain is awake, the left eye is open and vice versa. This ability enables some birds to sleep and fly. 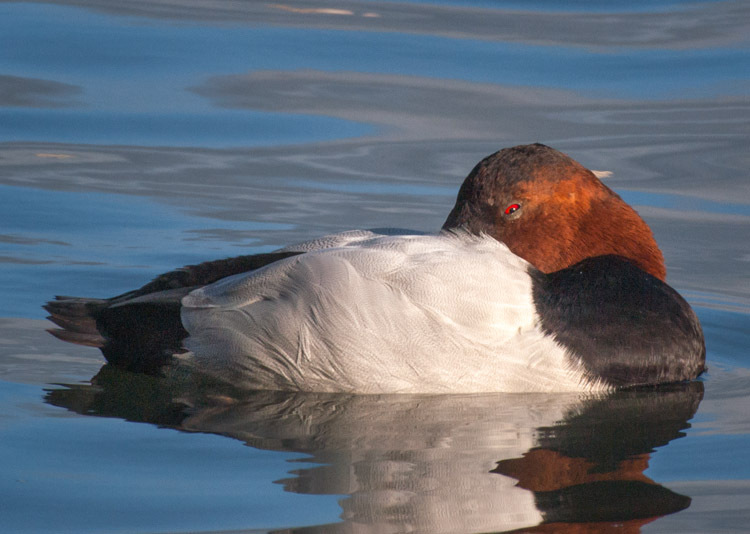 Half asleep is also useful to birds like ducks that sleep in groups. The ones on the edge of the group can be half asleep keeping watch while those in the centre can have both eyes shut and can be fully asleep. A final thought on sleep, think of all the little birds perched in the dark in sheltered spots in bushes and trees. How can they do that? Why don't they fall off? The words used to explain it are "flexor reflex". The pressure of the branch on the sole of the foot and the bending of the legs cause the foot to curl round and grip the branch without any conscious effort.